Here are 3 videos I made for the Ako Ay Pilipino Movement that my wife and I started a couple years back. Enjoy! Check out photos from this trip here. The mud swallowed up my shoes, and with every step I became more and more muddy. 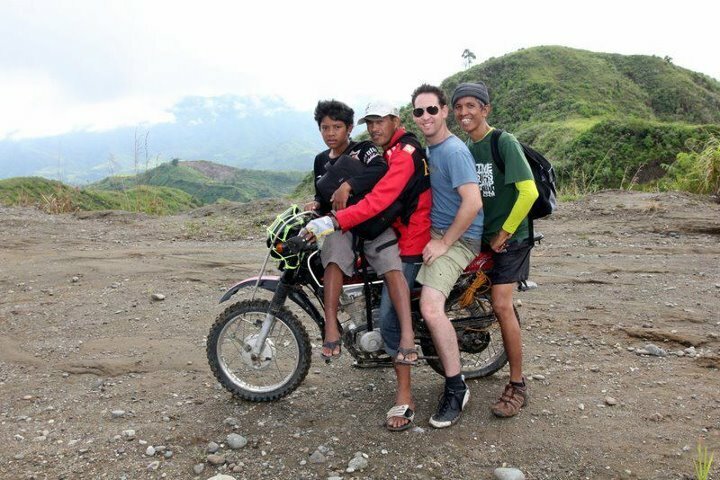 We had already taken a two hour truck ride up the mountain from Davao to Marahan, then crammed four bodies on a Japanese motorbike, bouncing over the dirt, up and down over mountain road to Malikongkong. From Malikongkong village we began the trek down, down into the jungle, over river and under tropical vegetation toward Borobo, where I had the privilege of seeing the trees that Lorna had planted over ten years before. They were one foot seedlings at that time. Now they rose into the blue sky, towering one hundred feet above the Kalayag training center—a wooden A-frame structure with cement floor. We napped under Lorna’s trees, ate boiled sweet potatoes and drank lemongrass tea, then continued our trek toward the bridge. Lorna used to tell me stories of her trek through the jungle where they did medical missions among the Matigsalog tribe long before we were married. The bridge did not exist at that time, and so they would have to pull themselves across the raging river by a rope strung from one side of the current to the other. “I lost my grip, and was almost carried down the river,” she told me. But at the last second, someone caught her up and dragged her to the opposite bank. There I stood, looking up at the cable footbridge. It stretched seventy-five feet above the river, swaying in the breeze. We climbed up the side of the embankment, grabbed hold of the cables, and stepped slowly as the bridge creaked and undulated. Sam began singing worship songs by Hillsong United as we made our final decent from Borobo to Gumitan village. “One way, Jesus…” His voice echoed through the valley below. Kuya Pio Arce led the team at a frantic pace under the scorching sun, and Jon Haver and I trailed behind to film the scenery. 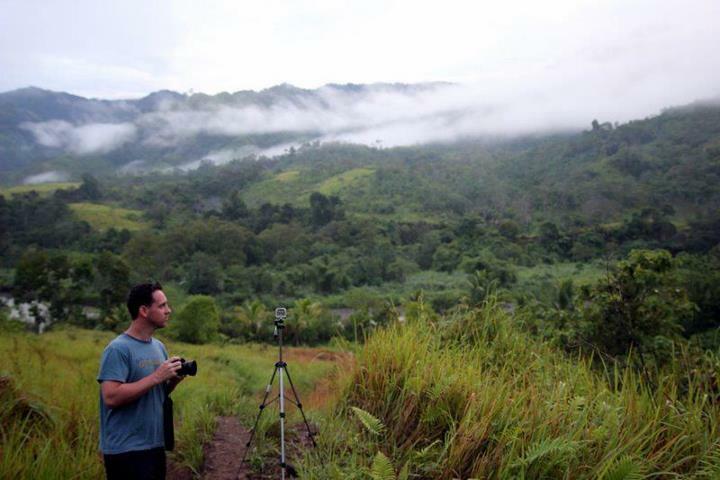 We both carried a Canon 550D (t2i), GoPro Hero2 and H4n, documenting the sights and sounds for the ministry promo I would soon be editing for Kalayag. The children in Gumitan were the most beautiful I had ever seen. The fact that their hair was not perfectly combed and their clothing was tattered did not at all take away from their precious appearance. The boys had the most handsome smiles, and the girls looked like they were wearing lipstick, so red were their lips. They were shy until I made silly faces at them, and soon they were laughing and screaming with delight. They ran and played in the tall grass near the village basketball court as the sun began to set over the lush mountains. Everything was slow motion for five seconds. I took it all in. Before we slept, I penned a few words into my journal, as a group of six little girls huddled around me, trying to read my sloppy penmanship. When I was finished, I said goodnight, they giggled, and I tried to make myself comfortable on the slab of cement. “This is the life of a missionary,” I thought to myself, and sleep came slow and staggered. The next morning we washed our faces and brushed our teeth in the fresh spring water system outside Kalayag training center. Boiled sweet potatoes and rice again for breakfast, with sweet corn and Spam that tasted surprisingly like bacon. We hiked back to Gumitan to speak at church, over the suspension bridge, and through the high waters after last night’s storm. Kuya Pio’s brother in law, Kuya Dan, the engineer who had designed the bridge and was now working on sustainable water systems among the Matigsalog tribe, shared about Jesus—the bridge from God to man. When Kuya Pio asked me to share, I encouraged the tribal members that they were now the bridges of God’s love to their family, neighbors and community. Halfway through the service, a demon possessed woman walked into the small chapel, shouting, crying and confused. Some were startled and scared, as others began to pray for her. “We cast you out in the name of Jesus,” we prayed, and someone took her away to minister to her. When church ended, everyone had a takeout boiled sweet potato for the hike back, and a steaming mug of Matigsalog coffee, some of the best coffee I had ever drank. It was dried with sweet corn, then pounded into powder, boiled (make a mental note here), and scooped into a mug. After years of missions work among the tribes in China, I was pleasantly surprised how delicious the Mindinao tribal food was. I was so impressed with the local coffee, that I asked Am-Am to buy me a few bags to take back to Manila. At a little after ten in the morning, we began our trek back over the bridge, past Borobo, up the steep, muddy footpaths toward Malikongkong. The rain the night before had wet the path, and unlike the previous day when we balanced and skipped over the rocks laid out as stepping stones across rivers, we now had no choice but to wade through the high streams and sink deeper into the muddy trails. The whole team was sweating profusely as we made our way up fourt-five degree angles, past fallen bamboo and thick jungle grass. A little past noon, we came upon a ridge overlooking the valley below, where we had just hiked, Malikongkong to the south. There on the ridge was a bamboo seating area with wood covering, and for the first time on the way back, cellphone signal. Kuya Pio called Ate Sonia, but I mostly just heard silence on his end of the phone, except for the word “hospital” in Visayan. My phone battery had drained from overuse of my installed flashlight while journaling the night before, so I asked to borrow Kuya Dan’s phone to call Lorna. But Kuya Pio said there’s no need to call. “We’ll be there soon,” he told me, and I immediately put two and two together. “What’s wrong with Lorna?” I asked. “I’m sorry to have to tell you,” he said, “but Lorna was admitted to the hospital a couple hours ago, after complaining that she couldn’t breathe.” I just stared at him blankly. I didn’t know what to say. I was so scared for my wife. Only five weeks earlier she had major surgery, and now here she was back in a hospital in Davao. An urgency came over me, and all I wanted to do was get back to the city. We took our last few sips of water, and began the uphill hike toward Malikongkong, where the motorbikes were waiting for us. I couldn’t feel my sunburn anymore. Malikongkong to Marahan was a bumpy blur. Seat space was excessive on the way back, with only three instead of four adult men per motorbike, but the road seemed a lot bumpier this time around. “My brain felt rattled,” Jon Haver told me. But all I could think about was whether or not Lorna was okay. She had been in the hospital for nearly five hours now, and I had been stuck in a valley far from the city, unable to help her. It was frustrating, but we were finally on the highway back to Davao now. The truck was loaded up, eight people in the back, the driver and I in the front of the cab because my back was hurting a little bit. After more than an hour in the truck, we arrived at Holy Spirit Hospital on the outskirts of Davao city, where Lorna had been admitted. I ran through the emergency room doors, and there she was laying on a hospital bed. I scooped her up into my arms, and hugged her tightly. “Don’t worry, honey,” she said, “I am feeling much better now.” I hugged her even tighter, and kissed her on the forehead, relieved that she was in my arms and that she was okay. After being released from the hospital, we took a taxi back to Hope Mountain, the Christian retreat center where we were staying. Lorna rested, recovered, and began to feel better. The next morning, Jon, Laura and I told Lorna about our trek through the Matigsalog mountains as we enjoyed a breakfast of french toast and eggs. Jon, Laura and Lorna made hot cups of Milo, and I decided to brew a cup of the tribal coffee I had got from the mountains. Brew, not boil, I reitterate. I scooped two tablespoons of grinds into a mug, poured in hot water, and enjoyed the reminiscent favors of village life. We called Maligaya Taxi Service, and we were soon on our way to Pio and Sonia Arce’s home near the beach. With all the footage that Jon and I had shot in the mountains, we now began to write a script for the Kalayag promotional video. After lunch, we had made good progress on the script, and suddenly I began to feel sick. I used the bathroom twice, and began to feel dizzy. We took a taxi back to Hope Mountain where I continued to have consecutive wet bowel movements, until I collapsed in the bathroom. “Jon! Please come help me!” Lorna called from number 12 Durian room to number 11 Mango room, and Jon came rushing in to help. I was already passed out on the toilet seat. Jon carried me outside and dumped me onto the back seat of the taxi. “You should call an ambulance!” I woke up as the taxi driver kept glancing in the rear view mirror at me, worried that he might be responsible if this got any worse. “You really should have called an ambulance!” I bounced in the back seat of the taxi as we barreled down the bumpy road toward the city, soaking Lorna’s shoulder as she held my perspiring head against herself. The rest is blurry. We got to the hospital just in time for me to collapse into a new bathroom, throw up and defecate at the same time. Incredible pain. I was put on an intravenous drip, but the pain relievers did not help. After what seemed like an eternity, I was strapped to a bed and rolled upstairs to a crowded hospital room. I could not stop vomiting and visiting the bathroom. After fits of pain, I fell asleep, I do not know for how long. I woke up to increased pain. That’s when they decided to take me to the best hospital in the Davao. I was in a state of shock. I was so dehydrated that I could barely think. Suddenly I was in an ambulance, and Lorna’s voice whispered to me in the distance, “I’m here, David. Don’t worry, I won’t leave you.” I reached around for her but I couldn’t find her. I strained to find my wife. She placed her hand softly on my cheek, and guided my eyes to see her. “I’m right here, honey.” Then she began to cry. My body was shutting down after being severely dehydrated. The flashing lights and wailing siren kept me mesmerized as we dodged through traffic toward Davao Doctors Hospital. Now, I don’t want to be too graphic, so all I am going to say is I had a potty mishap. Jon and Pio dragged me to the bathroom, which unfortunately was occupied. But I couldn’t wait. I threw up and had a bowel movement outside the restroom, then passed out. I remember being taken up to a private hospital room, where I would stay for the next thirty-six hours. It’s all just one long nightmare. Bathroom. Sleep. Bathroom. Sleep. Nurse changes intravenous drip bottle, takes my vital signs. Sleep. Pain. Sleep. Lorna was there with me the whole time—my personal nurse—lovingly taking care of me. A day and a half later, I woke up early and felt better for the first time. “Coffee, dear?” Lorna smirked. “Not funny, dear,” I said, but still I chuckled under my breath. After paying the hospital bills—a whopping $200 for everything from ambulance to hospital room, medicine and food—we took a taxi back to Hope Mountain where we met Pio and Sonia Arce. We filmed the rest of the promotional video, and later in the afternoon, caught our flight back to Manila. Yes, I am happy too. Happy to be alive, and happy to know that something good is going to come out of all of this. It’s true, Giovanni. This is the scary, arduous, incredible, adventurous life of a missionary, and there’s always a story to tell.